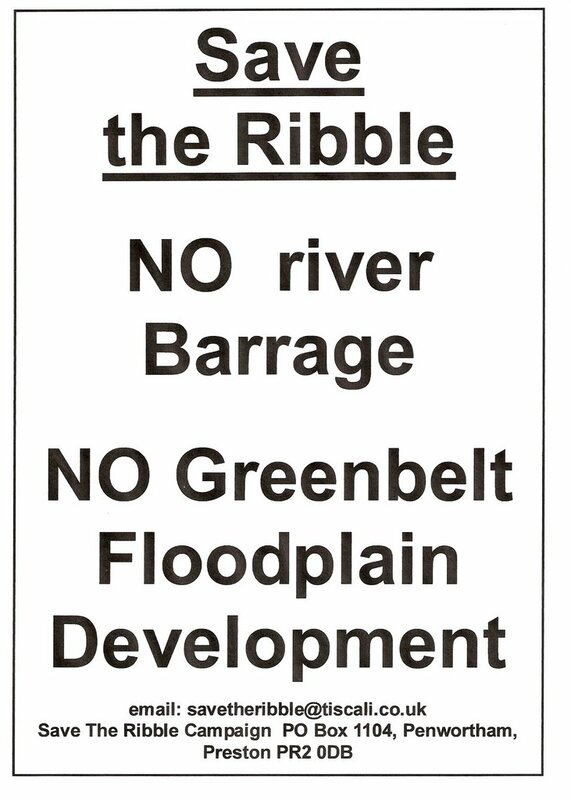 2. to develop on the Ribbleside Green spaces: on the South Ribble side of the river, opposite Avenham and Miller Parks; and on Frenchwood Rec and Fishwick Bottoms. -The barrage would irreversibly damage the entire ecosystem of the River Ribble and Estuary which is an area of International importance to wildlife. -The Ribble supports more bird species in internationally important numbers than any other site in the UK, and is one of the top 3 UK Wetland sites, alongside the Wash and Morecambe Bay. The Royal Society for the Protection of Birds is opposed to this barrage. -The Ribble is also a vital site for migratory fish, including Atlantic Salmon (the 10th Most Threatened species in Europe) and Sea Trout, all of whom depend on the tidal behaviour of the river. 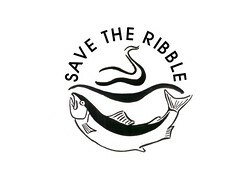 The Ribble Fisheries Consultative Association are working with the Environment Agency and the Ribble Catchment Conservation Trust to improve fish stocks, but have expressed their concerns that the Riverworks Project is ‘the greatest threat that our salmon and sea trout stocks could ever be faced with’ (Keith B. Spencer RFCA). 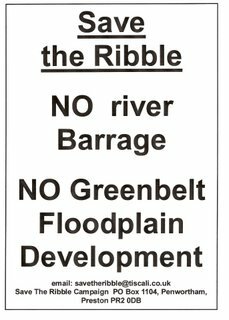 • The Ribble has the highest level of legal protection under both UK and European legislation: The Ribble and Alt Estuaries Special Protection Area is protected under the Habitats Regulations [Conservation (Natural Habitats &c) Regulations 1994] (EEC Birds Directive [79/409/EEC]. The RSPB, Lancashire Wildlife Trust, English Nature, The Lancs & Ribble Fisheries Consultative Associations, and The Regional Fisheries, Ecology and Recreation Advisory Committee to the Environment Agency. - lead to the risk of silt contamination of areas affected by flooding. e) affect the water quality above the barrage, increasing the risk of blue-green algae blooms, as affects Preston Marina, and increasing the build-up of pollutants and the subsequent environmental risks these pose. The water sports park this barrage is intended to create would increase traffic congestion, noise and pollution, and destroy the integrity, beauty, and peace of this area of South Ribble and Preston. d) provides the residents of South Ribble and Preston with access to beautiful, peaceful, unspoilt countryside right on our doorstep. e) includes our local football league playing fields. Our local allotments are also under threat as part of these development proposals. 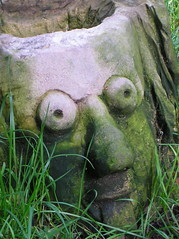 To build housing, businesses, and the necessary infrastructure of roads and services in this area, and convert what Green Belt remains into a formal park to mirror Avenham and Miller Parks will be detrimental to the integrity of this wildlife ecosystem, and the beauty and value to local residents that this area currently provides. The Campaign to Protect Rural England are very concerned about proposals to develop on this area. This land is also part of the natural flood plain in this area. The Environment Agency are currently warning of the dangers of further building in areas at risk of flooding, as this puts ‘new development at risk from flooding or [is] likely to exacerbate flooding elsewhere’. The EA’s concerns have increased due to the Department of Trade and Industry’s Foresight “Future Flooding” Report which predicts that ‘both the number of people in danger from flooding and the costs of damage from floods will rise significantly’: (see www.environment-agency.gov.uk/subjects/flood then follow links to “High Level Target 5: Development & Flood Risk 2004/5”). This adds to the increased flood risk that the barrage itself would bring. We have looked at the masterplan for the housing on the south side of the ribble. As usual Preston City Council have appointed a team of consultants who have no connection with the city. They will make their money and leave. We, who live here will lose the attributes which make the city unique. Avenham and Miller parks with the countryside beyond is one of the highlights of Preston. The proposal is to reduce it into an estate of barratt boxes which councils have allowed to blight the whole country. This is madness. What can Preston and South Ribble hope to gain from frittering away this beautiful resource, Is it simply to raise capital for the rest of their riverworks plan? We believe that Preston City Council have huge aspirations for the city and no idea of how to deliver them (look at the Tithebarn fiasco). How much of our council tax are they wasting on paying a team of consultants from outside our city to come in and propose its ruin? One example of the ignorance of these consultants; the impressive avenue of trees running the whole way down the old tram route across the river has been completely vandalised in the masterplan by Taylor Young. Even if this area were to be designated for housing it would be possible to incorporate this as a feature but instead it has been obliterated by large zones of pink shown as housing areas. It has stood for 150 years, it marks a significant piece of local history and an immeasurable resource for local wildlife as well as for the hundreds of people who use it every day. It is not possible to leave these decisions in the hands of the local authorities, the people of Preston and the people of South Ribble must be made aware of these proposals and must represent their resistance to their elected representatives.